Are you looking to enter the world of sales, or are you already a salesperson who's looking for new tips and tactics to expand your business? Whether you're in charge of your own selling career or you're responsible for training and managing a professional sales force, Selling All-In-One For Dummies features everything you need to know to improve your results. This valuable selling resource includes new ways to effectively network and prospect through the power of all the social media networking sites such as LinkedIn, Twitter, and Facebook, as well as ways to optimize sales success through Webinars; the latest tips and advice to build an appealing image; proven questioning methods that close sales; updated advice on keeping clients' business and building their loyalty; and how to adapt presentations and techniques. 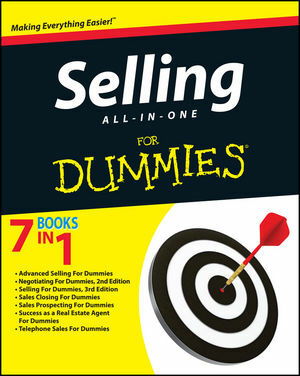 Selling All-In-One For Dummies is the authoritative guide to navigating the ever-changing and growing sales arena.